Smartly dressed in a subtle plaid suit with a hefty timepiece adorning his wrist, Torben Jensen looks like a regular, if not a more stylish-than-usual business executive. His nametag, however, is a giveaway that his office is not your usual place of business. Colorful and interlocking, the nametag is self-made of red and yellow Lego bricks, and sitting atop it is a Lego minifigure. As collectables, these figures usually depict story characters or people from different walks of life; at Legoland Japan, where Jensen is the divisional director, representative director and president, the figures adorning Legoland staff “brick badges” can be traded for other figures with other staff or Legoland visitors. Staff are encouraged to build their own badges the more creative, the better. For Jensen, minifigure trading has been integral to how Legoland Japan staff interacts with the theme park’s less outgoing guests. Noting that Legoland Japan guests tend to fall into three categories — the first is where the family embraces the concept and plays together, creating the aforementioned memorable moments that are part of the Lego ethos; the second, where families copy the first category families; and the last, where family members aren’t so familiar with playing together with Lego, and are comparatively passive — Jensen elaborates on the initiative’s success. “You can see when we’re doing a campaign. Whenever we have new figures on our name badges, the kids are running around and double-checking what figure you’ve got … . When a kid wants to trade, we reach out, and we do a high five with the figures and then exchange them. And then you’ll end up with a character where the hair or a hat is missing!” he said with a laugh. Minifigure trading aside, Jensen remains ebullient about Legoland Japan’s prospects. Despite initial criticism that the park’s ticket prices were too high, Jensen reiterates that what sets Legoland apart from its competitors is its focus on family experiences, playing together and developing skills. Coming to the park and playing with Lego, where staff works with guests, will ensure that age and skill-appropriate is bought, as opposed to Lego that “… is too complicated.” The recently opened Legoland Japan Resort, incorporating the Legoland Japan Hotel and interactive Sea Life Nagoya aquarium park, is an added-value option that Jensen stressed will help maximize the Legoland Japan experience. 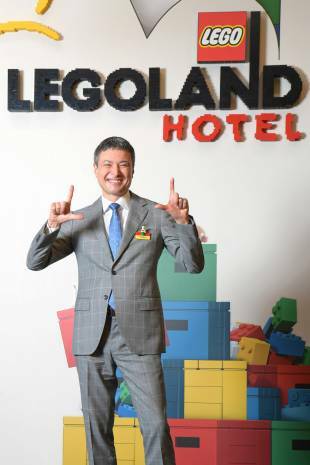 “One of the challenges in our opening year was that when the guests came to the park, they had to walk around (the hotel) construction site before they could get to the Legoland Japan main entrance … it wasn’t a fantastic first experience or impression,” Jensen said. Apart from the hotel’s proximity to the park, he noted that the hotel is designed with children in mind, with guest rooms featuring a designated kids’ play zone at the entrance. The aquarium is more interactive than most, with children encouraged to use magnifying glasses to observe the fish, as well as iPads to design their own sea creatures that are projected onto a mural as part of a larger sea life scene. A new water attraction that is set to open at the tail end of the rainy season, when Japan’s steamy summer holiday season kicks in, is yet another example of Lego’s attempts to create memorable moments and interactivity. “The attraction is ‘Beach Party.’ It’s basically a place for water play … kids can build a boat and put it on the river, and it will sail down and that kind of stuff,” he said. The concepts ring particularly true for Jensen, who is reminded of one of his first experiences with the Lego brand in his home country of Denmark. Born in Denmark to a Danish father and Japanese mother, Jensen admits to having an identity crisis growing up. Living as the epitome of the term hāfu, he struggled to fit in with his mostly Scandinavian-looking peers. “I wanted to be like my friends. I was born and brought up in Denmark, and … I had this hair color,” he said, wryly. Unsure of his plans after graduating from high school, Jensen joined the Danish army corps. “You’re enrolled in a leadership training program. During that time there was an officer who kind of told me, ‘Well, you’re pretty stupid. I mean your strength, it’s really your Japanese side, you should study it.’ I decided to go to Japan and do this extensive Japanese course. When I came home and told my mom that, she started crying,” he said. The experience in Japan set off a chain reaction where Jensen worked in positions focusing on Japanese and Danish trade. “Being born in Denmark, you have to figure out how to do look at things from a different perspective because we don’t have Mercedes Benz like Germany, we don’t have Volvo from Sweden,” he said. Returning to Denmark, Jensen was told he didn’t have enough experience working in Japan by his former Japanese professional colleagues. “I was getting fed up with this attitude,” he said. So when the chance came to work in the Danish consulate office in Hokkaido, he grabbed the opportunity, working on projects utilizing wind turbines and geothermal technology, among others. Little did Jensen know that he would later end up working at Legoland Japan. “I see pride in being able to go out there and work with the Lego team on the ground when that’s needed. … I really feel I’m delivering. I feel I’m a part of the team and also the team appreciates that I’m not just out there to check up what they’re doing. I’m actually trying to help them. Though honestly, I would be happier if this company could function without me being around, for then I will have been completely successful,” he said with a smile. A native of Denmark, Torben Jensen assumed the post of divisional director, representative director and president of Legoland Japan in 2015. Before taking on this position, he worked in various consulting and trade-related roles across Denmark and Japan, including four years in Hokkaido as support for the trade officer at the Consulate of Denmark in Sapporo. He also spent 11 years at Lantmannen Unibake as Asia divisional director, overseeing operations for the Japanese and Korean markets. Jensen’s educational trajectory also spans Denmark and Japan. Upon graduating from high school, Jensen served as second lieutenant in the Royal Danish Army. He later attended Tokai University, where he was enrolled in an intensive Japanese language course. Jensen has post-graduate qualifications from Copenhagen Business School and has completed further professional training and development at INSEAD in Singapore.